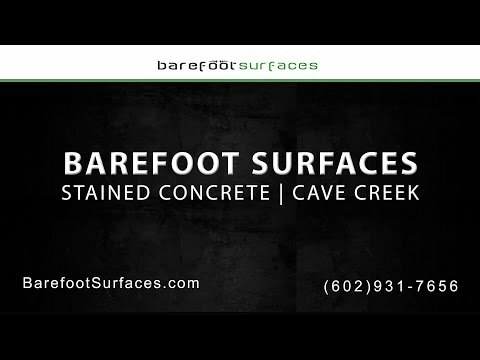 If you are looking for Cave Creek Concrete Stain services, look no further than Barefoot Surfaces. Our experienced professionals have the skills and knowledge in order to transform your home into the beautiful, luxurious solace that you have always wanted. We can update your flooring without the hassle of having to pay for expensive flooring options and installation. Our trusted experts are reliable and efficient and you know that you will be getting the best quality concrete staining services from us. With over two decades of experience in Arizona floor contracting, Barefoot Surfaces knows just what you need in order to give your home the update it requires. If you are looking for a simple, cost effective solution to your flooring problems, come to Barefoot Surfaces. Our company is dedicated to its customers and will provide the highest quality customer services for you. If you are looking to upgrade and renew the look of your floor, and are looking to do it on a budget, consider Cave Creek Concrete Stain services. Our employees are dedicated to providing you with the highest services available. With over two decades of flooring experience, your satisfaction will be guaranteed. Reliable and professional, our workers will always show up on time and make sure that everything is prepared and ready to go so that your floor will be stained properly and in a timely manner. Polite and efficient, you will never have to worry about the state of the work area. We clean up and replace everything in its proper order once the new concrete stain is clean and dry. Sometimes, new flooring can be expensive. You have to pay for the removal and clean up of the old flooring, and then you have to buy the new flooring, whether it’s carpet, tile, or wood. And even more expensive than the floor itself is the installation. This can be extremely costly for you and if you do not have the budget for it, then concrete floor staining is just right for you. It fits in with any decor and is easy to clean and maintain. Installation is budget friendly and you can choose a variety of colors, styles, and designs. Plus, it goes with any room- Kitchen, living room, and even in bathrooms! Don’t waste money on standard, flooring that goes into each specific room. Save your pennies on concrete staining for every room in your house! Contact us today to find out more about our Cave Creek stained concrete services! So if you are looking to replace your floor and update it with something that fits within your budget, come to Barefoot Surface for our Cave Creek Concrete staining services. With a library of styles, designs, colors, and rooms, you know that you will be getting the best quality concrete staining from us and that is our guarantee. Feel free to contact us with any questions or concerns about your newly installed floor, or to get a consultation on your future concrete stain. Our professionals are here to help you with any problem that might arise. Don’t let the budget and effort effect your decision. Contact us today!